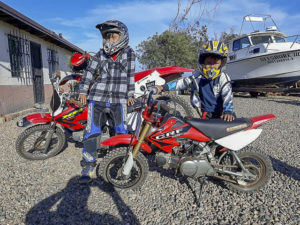 Discussion in 'Baja Bytes By Gary Graham' started by Baja Bytes, Nov 19, 2018. While most are thinking about turkey and stuffing, the striped marlin are still practically chewing the paint off the bottom of the boats at the Finger Bank above Land’s End with double-digit releases, along with a few dorado, yellowfin tuna and wahoo in the mix. It’s as good as Magdalena according to the locals. 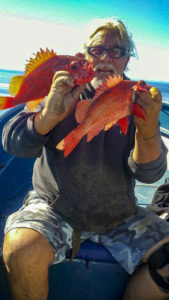 The Vizcaino Peninsula from Bahía Asunción to Abreojos is producing some variety to the expected yellowtail bite with an occasional wahoo or dorado. 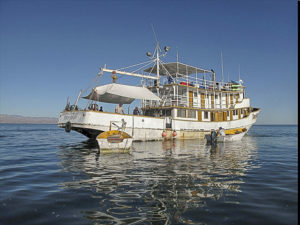 Then farther up into the Sea of Cortez, from East Cape to Loreto, the North Winds hamper the quality of the fishing trips. Happy Thanksgiving and good fishing! Sheila Giovanna Verduzco— with Matthew Clifton and J. David LeCompte in Bahía Magdalena, Baja California Sur, Mexico.“〰 I would like to thank each of the people who took a little of their time to congratulate me on my birthday, thank you very much with all my heart. “It really was a birthday that I will never forget! “We had already planned to go fishing at Magdalena Bay. And these are some pictures of the trip that were the best; we had very good fishing, the best food! Thanks to the crew the best however! “But here comes the best part!!!!! … … I SAID YESSSS!!! Overall the fishing is slow-to-fair at best. The kelp line is giving up a few bonito along with short barracuda, mackerel and mostly short calico bass. You might get lucky and score a yellow up in the La Jolla area, but those have been hard to come by. Guys are also catching plenty of little rockfish. Some sand bass are biting down at Bull Ring on the lead head and squid combo, a few are nice 4- to 6-pound units. Limits again! 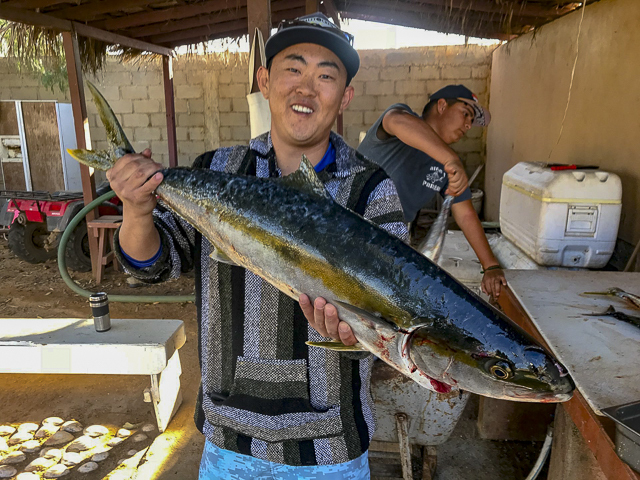 Captain Alec took the boat down to the Coronado Islands for another great trip catching limits of yellowtail and 20 large bonito! Tomorrow morning’s trip is a definite “go!” Grab your passport, some yo-yo jigs and some 2/0- to 3/0- live bait hooks and torpedo sinkers. For reservations, please call H&M Landing at 619-222-1144 or just show up in the morning by 5! Yellowtail fishing was wide open yesterday and continues today. For example, 29 passengers on the San Diego scored 145 yellows in the 12- to 18-pound class yesterday. That comes out to a full 5-fish Mexican limit for all on board. The Mission Belle scored limits too. Just 8 passengers got 40 yellows. Finally, the Grande was also there and scored limits as well with 85 yellows for 17 passengers. The vast majority of these came on the yoyo iron with only a few coming on the dropper loop sardine. 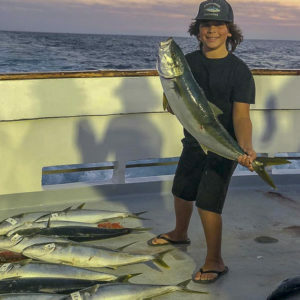 Today the bite continues with San Diego and the Mission Belle both calling in at 10:30 a.m. with 40+ yellowtail. That said, there is also yellowtail NE of North Island and on the ridge running along the weather side of North Island. If you want bonito there are plenty of those around. Most are in the 5- to 8 class, but there are a few topping the 10- to 12-pound mark eager to jump on a trolled feather or Rapala. Very few boats are fishing below the border as the season winds down. Today we got a few reports, though we are not hearing much from Mexican waters. All were for kelp paddy yellowtail from the area just outside the 9 through Coronado Canyon to the 425. Just came back from San Felipe fishing on the Tony Reyes Charter where I caught a 45-pound sea bass and a lot of yellowfin tuna. Has anyone else fished the Tony Reyes? My first time. Experiences and feedback? I spoke too soon last week about the North Wind’s arrival date. Cold gusts started Sunday night and put the typical winter style damper on most fishing trips until Wednesday. 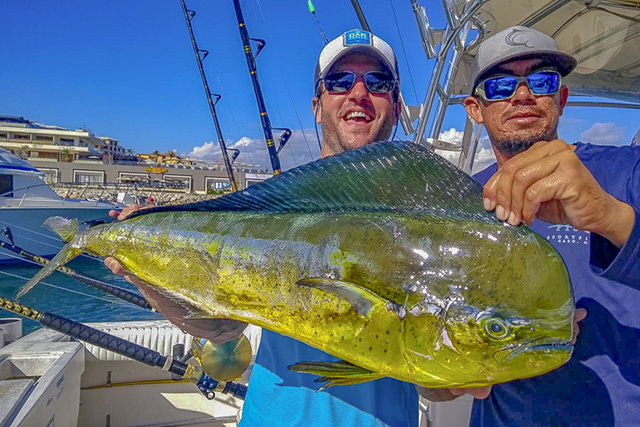 Still warm water and by the weekend we had minimum wind and better results with dorado in the 15-pound range. After long battles, Travis holds up his big fish and you can see Melinda’s bent rod in the background. With Captain Pancho from the Tailhunter Fleet helps Melinda with her fish a number of minutes later. Jonathan Roldan of Tailhunter International reported a mixed bag of fish as La Paz transitions into the cooler aspects of the season. He added, “This is that time before the holidays when folks aren’t travelling much. Families are doing other things. Also, the weather and waters are changing. It’s wonderfully sunny, but cooler and also getting more and more breezy. So, it can be a tad rougher which makes it harder to get live bait. Either the bait guys aren’t going out very much since not many folks are fishing or because of the weather, the live bait is scattered. 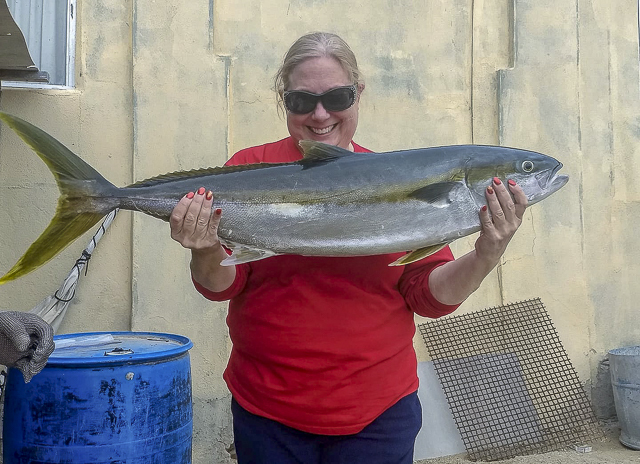 “Good bites of bonito keep things interesting,” he said, “But in between, we’re getting a few yellowfin tuna up to about 25-pounds. There’s some nice dorado not far offshore. Inshore, pargo and cabrilla are becoming more predominant, especially as it gets tougher to get too far from shore because of weather conditions. Also, surprisingly, some nice 30- to 50-pound roosterfish are still around. Still busy with visiting anglers though after Thanksgiving the number of visitors will decrease. The strong gusty northerly winds were relentless. Beginning on Monday, and finally weakening on Friday. 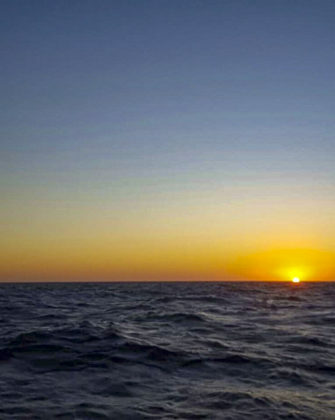 Ocean water temperatures dropped into the 78- to 80-degree range. Clarity was good, though strong winds made it difficult to fish on the more productive grounds from Iman to San Luis Banks. More frequent sightings of whales as the first wave of the annual migration of these mammals arrive. 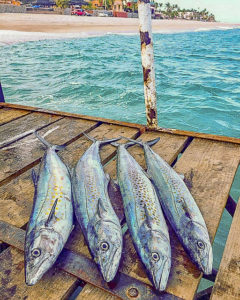 The main bait being used now are slabs of squid, caballito, ballyhoo, chihuil and small-sized skipjack. 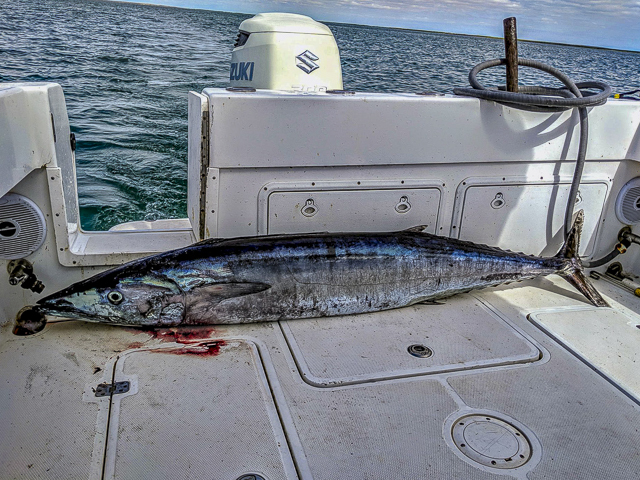 Fleets have been fishing in all directions, but no “hot spot.” Heavy boat pressure, along with windy conditions made for tough fishing, though It didn’t keep charters from launching, nor did it limit what options were available. Wahoo are in peak season, striking best on chihuil, ballyhoo and caballito. They are also striking lures, Rapalas and skirted lead heads. Though with heavy boat pressure over the past month, these fish are hit or miss; some are fortunate to land one, but others have taken as many as four or five. Sizes range from juvenile 6-pounds up to trophy-sized 65-pounds. 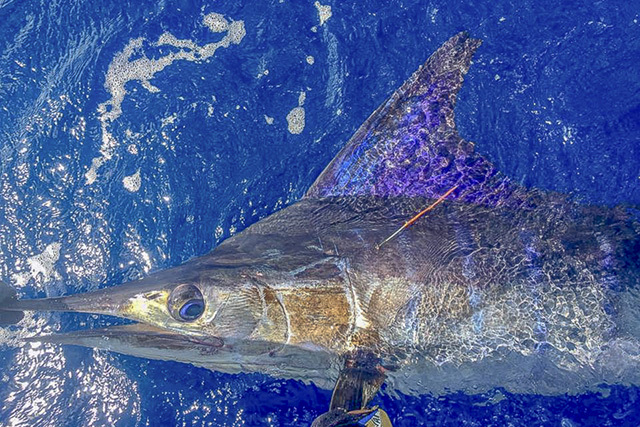 Dorado were more scattered though very few have been seen in recent days — same for billfish. Still an occasional sailfish or smaller-sized striped marlin, although one blue marlin was taken around 220-pounds. Yellowfin tuna action on the banks to the north, Iman and San Luis, has proven very difficult recently because of the North Wind … it has been hard to drift and chum as it swept you off the spot so quickly. There were yellowfin caught every day from small football-sized all the way up to 90-pounds, plus a few tuna. Numbers at a glance: Billfish 59%, tuna 24%, dorado 28%, other species 9%. First, I would like to apologize for the lack of reports over the past month. This does not in any way reflect the fishing; it has been off the charts — like we haven’t see in Cabo in years and this week is no different! I will be updating the reports from the last month in this report, so you will be able to use it as a reference if needed. I will start off with what I think is a pretty impressive number… There were 376 billfish caught by Pisces this week, out of which 375 billfish were released, 104 of those billfish were caught in just ONE day, while 84 of those were caught by only THREE boats in one day. That’s the kind of billfish fishing we’re experiencing now! The majority of these billfish were striped marlin caught at Finger Bank, about 50 miles north of Cabo; however, there have also been marlin closer by — just not the double-digits we’ve seen farther North. The billfish caught this week also included sailfish, spearfish, black marlin and even a 415-pound blue marlin caught by Pisces 28’ Andrea. Apart from billfish, we had a few impressive yellowfin tuna, including a 270-pound yellowfin caught aboard Pisces 35’ Knot Workin, only two days after the end of the WON Tuna Tournament (the winning tuna, netting almost $400k was 272-pounds!) and a 127-pound tuna on Pisces 31’ La Brisa. We’ve also seen quite a few wahoo and good dorado numbers. And to top it off, many of our boats were entered in the Los Cabos Big Game Charter Boat Classic (the only tourney which boasts free entry if you charter a boat) and we are proud to say we placed in the top three places daily. The largest tally of billfish caught in ONE day out at the Finger this week was by Pisces 42’ Caliente, captained by Jaime Gonzales. 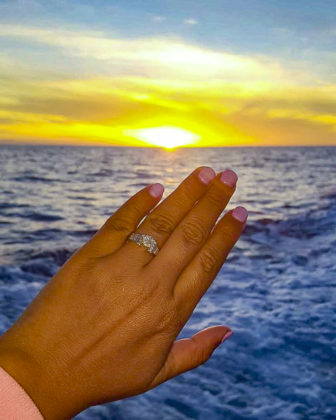 The same anglers fished the Finger two days in a row, November 14 and 15, landing 68 marlin total. Amazingly, they caught 34 fish each day (yes, the same number both days). Caliente found luck with the stripeys even without going to the Finger though. Earlier in the week they caught and released 5 striped marlin, all around 120 pounds, on ballyhoo bait out of Gaspareno, where they also landed a 20-pound dorado. Anglers were from Wakefield, Rhode Island. Pisces 31’ Rebecca also had a spectacular day at the Finger on the 15th, landing 28 striped marlin, 2 sailfish and one dorado for lunch, by anglers Alexander Lejonklou and Bertil Peterson who made their trip all the way from Sweden well worth it as they also fished the Rebecca on November 12 and caught and released 20 striped marlin. 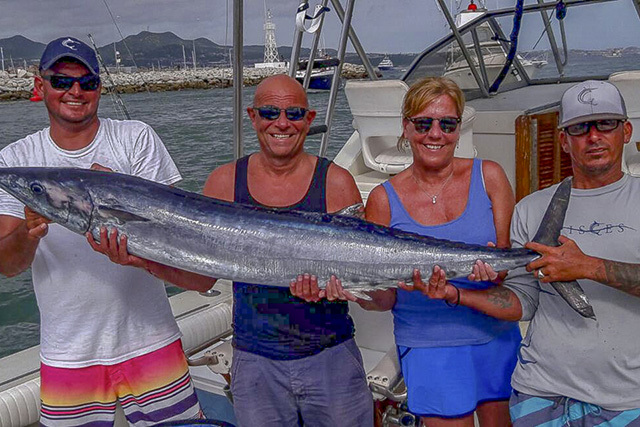 Anglers Bruce Welsh, David Palmer and James Schrank onboard Rebecca on the 10th also had a spectacular day, catching and releasing 22 striped marlin and a nice 40-pound wahoo on mackerel bait. Also present at the Finger Bank this week was Pisces 42’ Yahoo, which caught and released 20 striped marlin. All boats headed to the Finger used a mix of live caballito and mackerel bait, and ballyhoo occasionally. 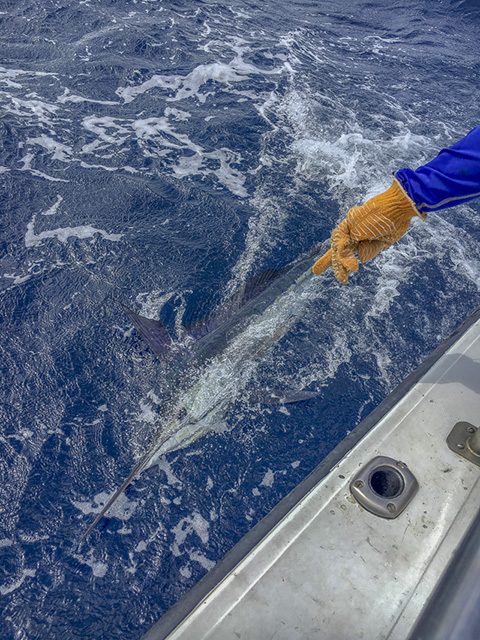 Earlier in the week, Pisces 38’ C Rod also impressed with a double-digit marlin count out at the Finger, with 24 striped marlin caught and released by anglers Chris Bekaert, Dave Burnett, Michael Brown, Scott Pearson and Sue Bekaertfrom Ontario, Canada. All marlin caught at the Finger this week averaged about 100- to 120-pounds. Others who had great marlin catches nearer to Cabo were Pisces 31’ La Brisa, Tracy Ann and Tiburon. 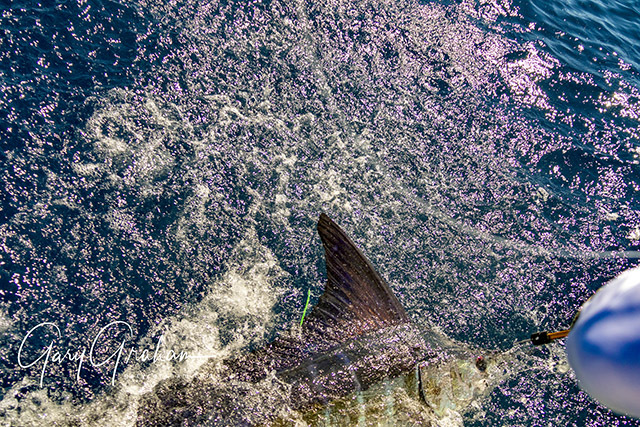 I think we will start seeing the marlin move closer to Cabo in the next few weeks. November 11, La Brisa caught and released 6 striped marlin, with the largest of about 180-pounds. The fish were caught on mackerel bait and on green and yellow lures out at “La Brecha.” Anglers were Justin and Robert Pill and Glen Gardner. 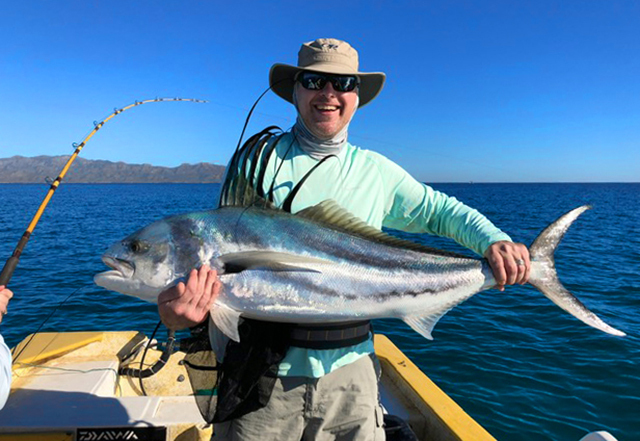 La Brisa did well again two days later, this time entered in the Los Cabos Big Game Charter Boat Classic Tournament with anglers Bob Mc Kee, Nick Teal and Roger Bradbury from Redhill in Surrey, United Kingdom. Tracy Ann also caught 6 striped marlin later in the week, the largest of which was about 150-pounds, caught on caballito and mackerel out of Punta Lobos. They landed 2 striped marlin which they released, along with one dorado of about 12-pounds and 9 yellowfin tuna. Their largest tuna of 127-pounds gave them 1st place in Day One of the Tournament, netting $1,800 for the day. 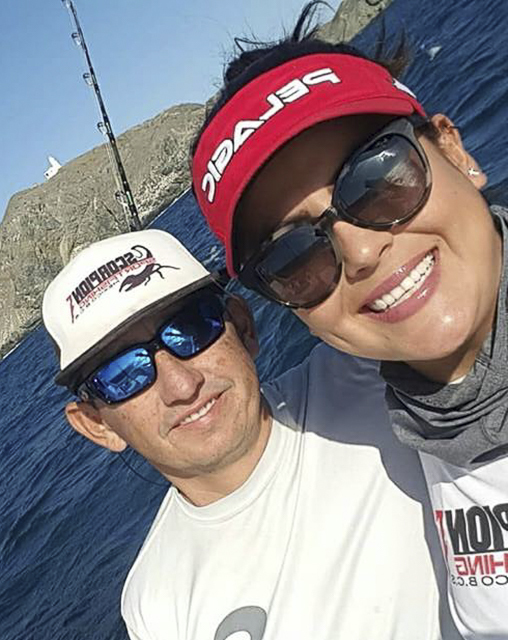 This is the only free-entry fishing tournament on the Baja California Peninsula lasting four days from Nov 13 – 16 and had 100-plus boats enter. 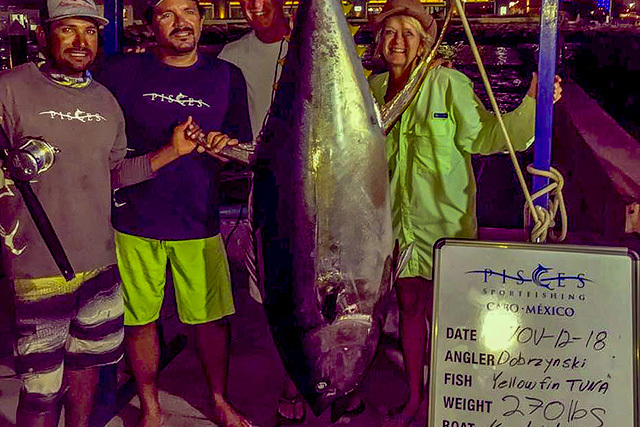 Day 1: 1st Place Tuna: 31’ La Brisa with a 127-pound tuna. 2nd Place Dorado: 28’ Adriana with a 17.2-pound dorado. Day 2: 1st Place Dorado: 31’ Rebecca with a 20.6-pound dorado. Day 3: 1st Place Dorado: 28’ Adriana with a 21-pounddorado. Day 4: 2nd Place Tuna: 27’ BajaMark with a 86-pound tuna. 2nd Place Dorado: 38’ C Rod with a 18.6-pound dorado. 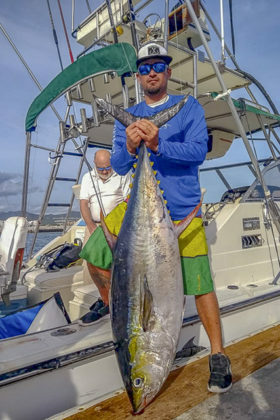 The angler(s) catching the largest tuna, wahoo and dorado won $1,800 each day, the second largest of each species took $900 each day and the third largest of each species $635 each day. 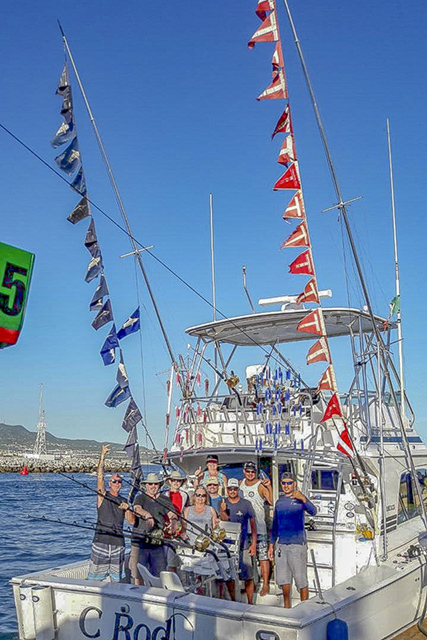 As the 2018 Los Cabos Big Game Charter Boat Classic came to an end, registration records showed close to 460 anglers participated in the event. Next year’s dates are the Tuesday through Friday before the week of Thanksgiving in the United States: Nov. 19-22. For info or to register go to www.loscabostournaments.com. Now for some of the black and blues of the week, starting off with Pisces 32’ Bill Collector, and a beautiful black marlin of about 230-pounds which they tagged and released. The anglers also landed another striped marlin of about 130-pounds. Both fish hit on caballito bait. The next day Bill Collector caught 4 striped marlin at Golden Gate on mackerel bait and a blue marlin of about 200-pounds, on a black/red lure at the 70 Spot, which they released. Pisces 28’ Andrea had a spectacular catch this week, with our English anglers catching a 415-pound blue marlin on a tigrillo lure out at Gaspareño. They also landed a 10-pound dorado on a red and white lure. These same anglers fished on the 31’ Tiburon a few days later and landed 4 striped marlin, which they released, all hitting on mackerel and caballito live bait out from the Golden Gate shoreline. 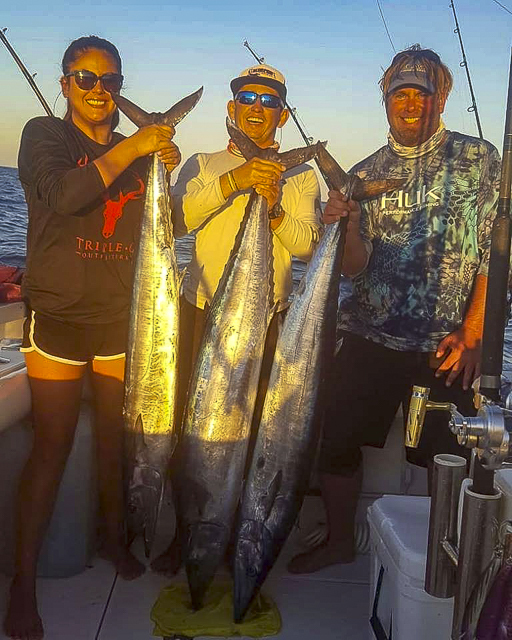 And the largest tuna caught this week was by Pisces 35’ Knot Workin and anglers Beth and David Dobrzynski from Rochester, NY, who had themselves the fishing day of a lifetime. They started off by catching and releasing a striped marlin each, which hit on a green feather lure at about 12 miles, around the 200 Spot. 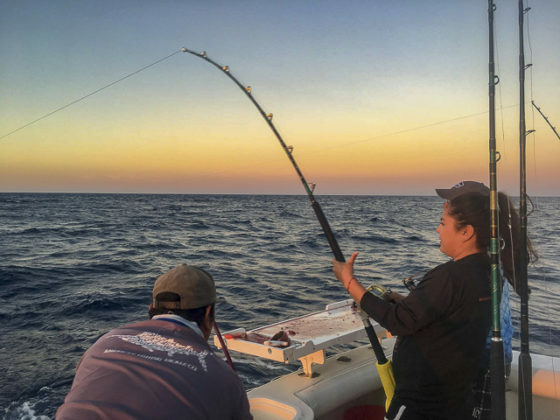 They also released a sailfish there, which hit on caballito bait and then went on to catch 5 yellowfin tuna which hit on cedar plugs, feathers and caballito bait. All tuna were about 20-pounds, except for one. They fought their tuna for 3.5 hours on 100-pound test, returning after the sun had set; but it was worth it, the monster fish weighed in at 270-pounds! A great job by anglers and crew. Pisces 60’ Reel Machine had some luck with the yellowfin as well, not in size but in numbers; they caught 19 yellowfin ranging from 10- to 40-pounds each on cedar plug lures about 20 miles out from the Old Lighthouse. They also landed a very decent-sized dorado, of about 30-pounds which hit on a flying fish lure. Their day culminated with a nice 40-pound spearfish which they released. More tuna and dorado caught on Pisces 31’ Tiburon which landed 5 dorado between 15- and 20-pounds each out of Cerritos on feathers, and then ended with 3 yellowfin of about 15- to 20-pounds out of Gaspareño the next day along with 2 striped marlin (released) which hit on green/black lures and a nice 15-pound dorado which hit on a feather lure as well. Cabo Climate: The second week of the month started with very pleasant weather and mostly sunny-to-partly cloudy skies with average daytime temps in the upper mid-80s and evenings in the low-70s. The 2-week outlook is for more of the same with daytime temps in the low-80s and evenings in the low-70s to mid-60s. The good news is there is no rain forecast through the end of the month with only a 20% chance of any precipitation the last few days of the month. Winds are expected in the gentle 6- to 7-mph range through the end of the month. Humidity is expected to run in the mid-50% to 60% range toward the end of November. Sea Conditions: Seas have been relatively calm in the mornings throughout the area with some swells showing up in the afternoons. Forecast is for more of the same with winds in the 6- to 7-mph range out of the West and WNW. Sea temps are running from 78- to 81 (Pacific) to 80- to 83 around the inside corner to the Gordas. There are reports of a plume of warmer water running from the Golden Gate down to the San Jamie and this has been very productive. Best Fishing Areas: The hot spots seem to be shifting to the west and north. Good counts of marlin are showing up around Cabo Falso and the Lighthouse and out to the San Jamie and Golden Gate Banks. Sailfish and striped marlin counts are good in the Migrino, Cabeza de Ballera and Punta Gorda areas and the quality dorado seem to have moved north on the Pacific side along Migrino as well. The yellowfin are being found 15 to 25 miles out from the Herradura west to the San Jamie Bank. 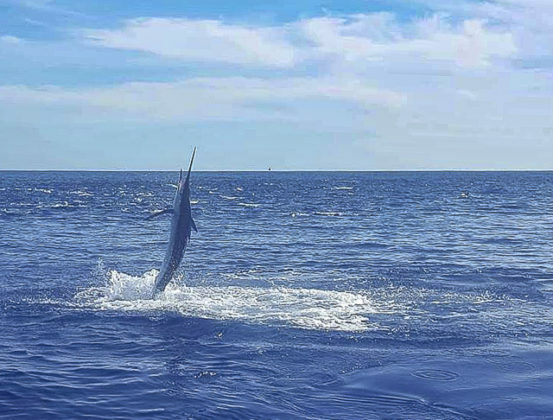 For those willing to make the longer runs, the Finger Bank has started producing multiple striped marlin counts with a few boats reporting over 20 fish per day. Traffic is light up there competing for increasing numbers of migrating striped marlin. Best Bait & Lures: Feathers and cedar plugs were the favorite for the tuna with trolled smoke trail lures the favorite for the blue and black marlin. Live bait tossed to tailing stripers was also successful. Soaking live baits around the Finger Bank produced successful multiple striper counts. Tunahead and mrkrabs like this. Tunahead and Baja Bytes like this. Awesome report and pics as usual. Some Serious "Skinnies" down south.